TO GREAT FALLS, MT -- BACK IN THE USA!! Yes, I'm so glad I'm livin' in the USA. Anything you want, we got it right here in the USA." ~ part of the lyrics from Chuck Berry's 1959 song, "Back in the USA"
Funny, but all I can remember is the melody to the Beatles' parody, "Back in the USSR!" We are used to being online for several hours every day. We were too frugal to use our cell phones to make calls or our MiFi card to get online during the last seven days through Canada and we weren't able to get free WiFi whenever we wanted it (more a problem for me than Jim because I have a PC, not a portable laptop). Now we feel more "connected" and we can freely check our e-mail, finances, news reports, weather, etc. again on the internet. The weather hasn't been the greatest all summer. It was one of the coldest, wettest summers in Alaska's recent history. Much of the time we were in Canada in June and this past week was also cold, wet, or overcast. Here in Great Falls it's warmer, sunny, and the lowest humidity we've had since we left here in early June. Finally, after so many new things we experienced during our whole Alaska-Canada adventure the past 3� months it's nice to be on more familiar turf again. Jim lived in Montana for 18 years and I lived there with him for five years before we bought our property in Virginia. 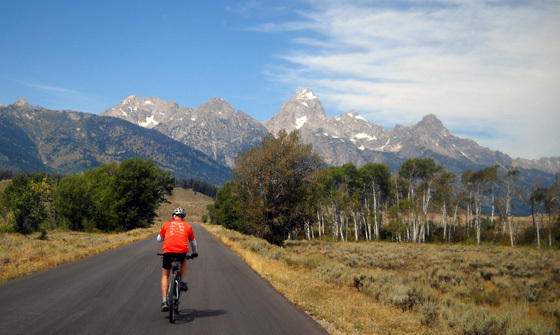 Montana, South Dakota, and other states out West feel more like "home" to us than Virginia does. This was another relatively long day on the road but not as long as yesterday. 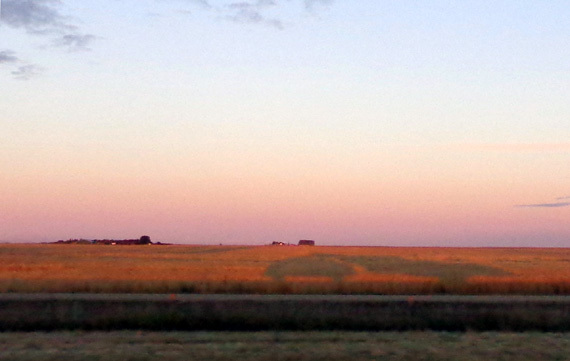 We drove from Olds, Alberta to Gateway FamCamp on Malmstrom Air Force Base in Great Falls, Montana. It took us a little over seven hours with two fuel stops, a border crossing, lunch, and potty stops. 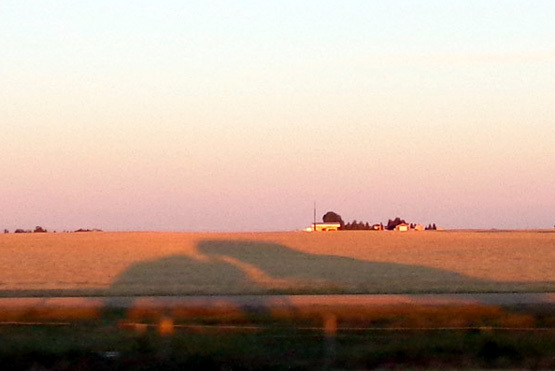 The RV silhouettes remind me of similar photos I took in New Mexico last winter. Before we pulled out from Walmart this morning Jim noted that the guy parked near us in an old Class C motorhome was hooked up to the electrical outlet in a post in the parking lot! We didn�t see that before we went to bed. Pretty good if you can work that out! You better bet we�ll be looking for an outlet at the next WM . . . or maybe it�s a Canadian/Alaska thing. Some parking lots have electrical outlets to keep vehicle engines warm during the winter. We�ve seen them at some schools and businesses in the Far North. 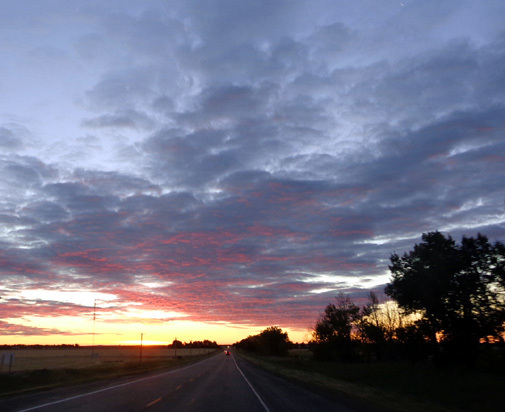 WEATHER: low 30s F. throughout southern Alberta in the morning, low 60s F. in Great Falls in the afternoon. Sunshine all day with a few clouds. Minimal wind. Great weather all day and it's supposed to get warmer this week in Great Falls. 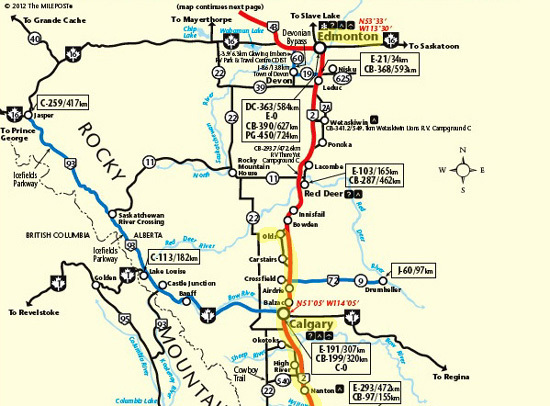 ROUTE: east on AB 27 to AB 2, south through Calgary to McLeod, AB 3 to Lethbridge, AB 4 south of Lethbridge to the U.S. border, then south on I-15 to Great Falls. The Air Force Base is on the SE part of town. We missed the first turn for AB 4 in Lethbridge and went through town. We didn�t go any extra distance but it took longer. 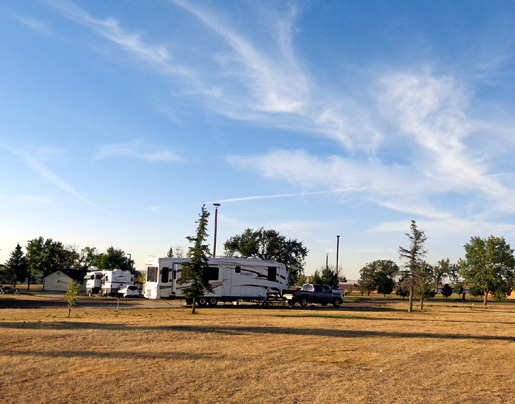 There are numerous RV dealers and storage places near both Edmonton and Calgary. I still saw numerous RVs in peoples� yards, too. Appears to me that RVing is more popular in Alberta and British Columbia than most of the U.S. (or maybe folks in the U.S. aren't allowed to keep their RVs on their own property as often?). ROAD CONDITIONS: good all day. 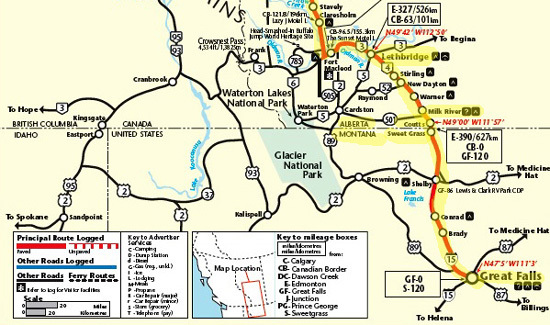 We saw road work in only one place (in Montana, at a river crossing) but it didn�t slow us down much. TRAFFIC CONDITIONS: heavy in both directions from Olds to and through Calgary; moderately light down to Lethbridge, then scant all the way to Great Falls. It took 30+ minutes to get through metro Calgary from 7:45-8:15 AM, right at rush hour. We had stop and go traffic for several miles to the center of town. We knew we'd hit the morning rush there but we wanted to reach Great Falls as early as possible in the afternoon. FUEL: We filled the tank with diesel at FasGas in Olds after we left Walmart this morning ($1.139/liter = $4.28/gallon Canadian). That went better than the six gallons we got at the Exxon in Shelby, MT. We didn�t think we could make it all the way to Great Falls. We had to go through the truck lanes and Jim had to go inside to pay. It was $4.13/gallon U.S., which was higher than we expected. The range we saw coming through Great Falls was $4.09-4.13. Bruce, the campground host at Malmstrom AFB, said diesel went up 10 cents/gallon about a week ago. There is no diesel on base, unfortunately. TERRAIN: We could see the Rockies soon after getting on the freeway at Olds and all the rest of the way down to Great Falls. There were fewer clouds over the mountains today. I could see snow at higher elevations. 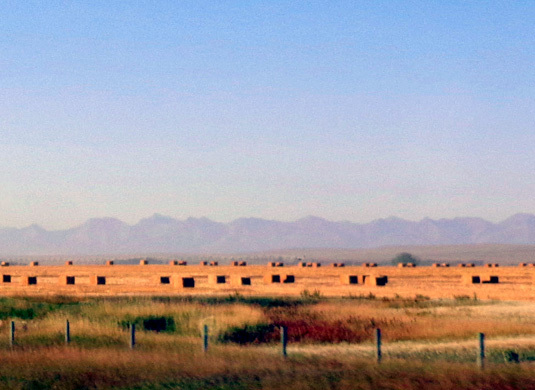 The terrain through which we drove was fairly flat in Alberta and a little hillier in Montana. 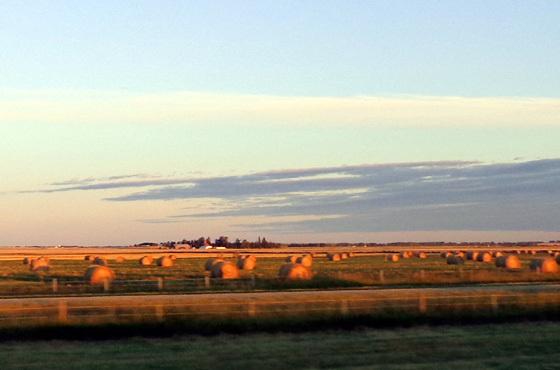 I didn�t see any flowers this morning along the roadway in Alberta. South of Shelby, MT there were sunflowers, yellow daisies, and other flowers. Ditto at the campground in Great Falls � purple aster-like clumps, low clumps of yellow daisies, even shorter clumps of white daisy-like flowers � and dandelions, of course. 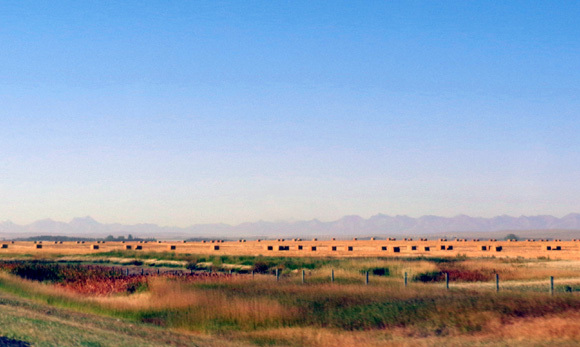 We heard on the news that 4,800 hectares (= 11,856 acres) of grassland burned on the Blood Indian Reserve west of Lethbridge, Alberta, fanned by 80 km winds (= ~ 50 MPH). Some of the damage was outside the reserve near Lethbridge. I'm glad we didn�t want to go through there when the fire was burning. 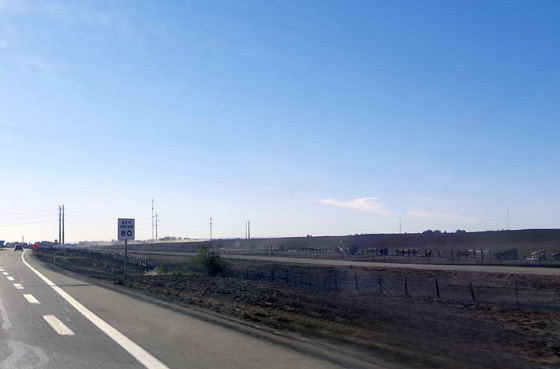 With a west wind and fire to the pavement on that side, the four-lane road surely would have been closed. 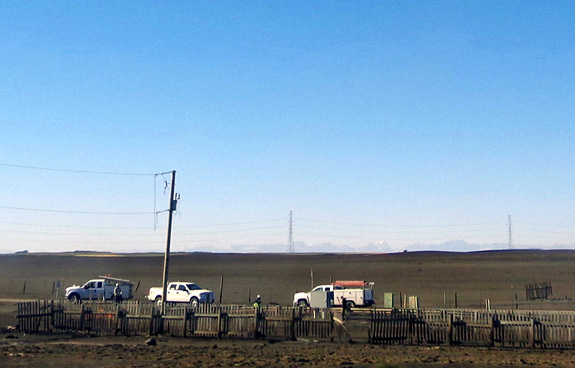 We heard the last two days that some folks in Milk River were also evacuated but we didn�t see any burned areas there. The Sweet Grass-Coutts border crossing was quick again. We're four-for-four on this trip for not having to go through an RV or truck inspection. Whew! After looking briefly at our passports he asked us about our residence and where we�re going, how long we were in Canada, whether we had any firearms (bear spray OK), whether we had any fruits or vegetables from Canada (two bananas = OK, everything else was from Alaska), and if we had any seafood. When we said frozen salmon, he asked if we caught it. We said we bought it at Safeway in Alaska and that was OK.
Not sure if it would have been a problem if we�d caught it or if that was a conversational question! He knew we had a dog but didn�t ask about Cody�s papers or health, alcohol, vehicle registration or insurance, prescription drugs, other food questions, etc. I don�t regret the research we both did re: crossing the borders on this trip but I regret all the worrying I did before the first crossing in early June. 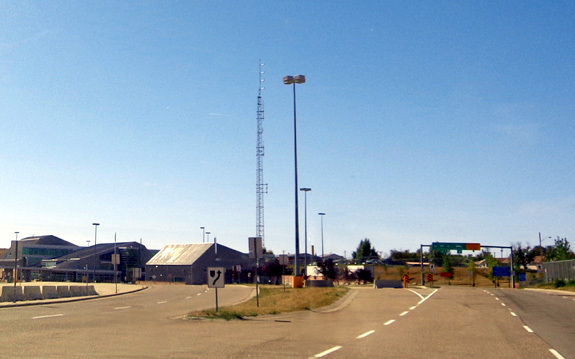 All four border crossings were uneventful this summer. I�m not saying either country is lax. We had our ducks in a row, answered the questions honestly, and had nothing to hide. 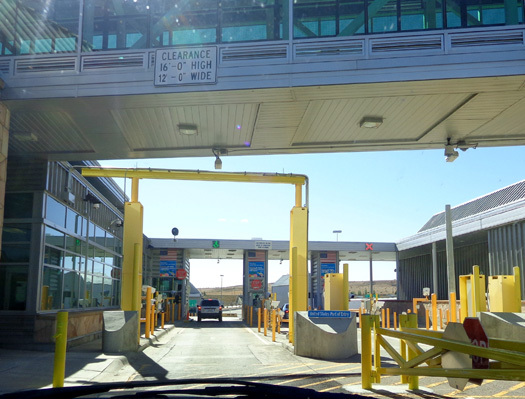 We highly recommend other travelers simply follow the rules and be courteous to the border agents. We�re very glad we didn�t have to endure the hassle of having the camper and truck searched. In all the years we've both been traveling by RV that has happened to us only one time � at the White Sands Missile Base in New Mexico when we camped there several years ago. We are camped for the next week at Gateway FamCamp at Malmstrom AFB where we camped at the end of May. I'll describe the facilities and show photos in the next entry.